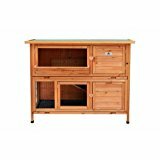 Keep your rabbit safe and secure with this double sized Confidence Rabbit Hutch. Providing protection from predators in the backyard or in the house, suitable for both the inside and outdoors. The best thing about a well made Rabbit Hutch is it gives your cute bunny a place it can offically call home! This entry was posted in Small Animals and tagged Confidence, Deluxe, HUTCH, RABBIT by One Boutique. Bookmark the permalink.